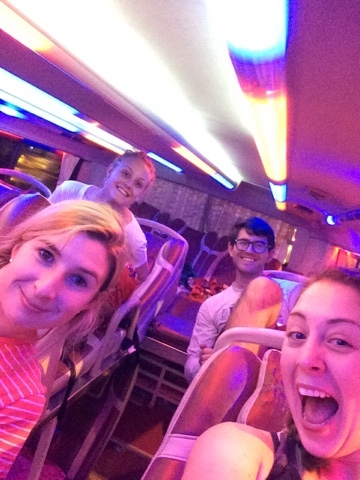 In true Harry Potter style I’m currently lying on (k)night bus travelling from Ho Chi Minh to Nha Trang. There’s a man snoring next to me, and when the bus goes over huge bumps everyone’s “beds” fly up – it’s pretty cool and funny all at the same time. Plus it was only like £12 and there’s wifi! So the story begins with over 20 hours of travelling. I had a lovely old lady, Kathleen next to me on the plane out for initial 13hour flight – one of those ones when you go forward so far time that you miss a day and you spend the following few hours confused and wondering if it really is Thursday already. 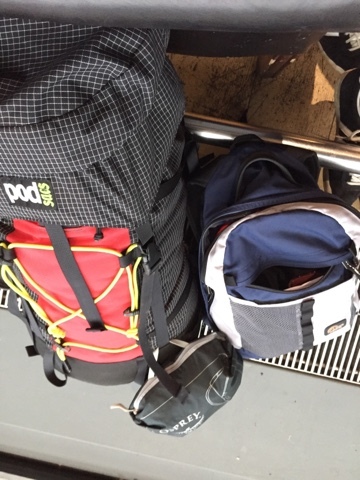 Our first hostel was fab – the staff were so helpful and we really needed it with booking trains and buses so we can get to the locations we’ve planned! Having got sorted and been given a room to dump our bags in we headed out into Ho Chi Minh to explore the sights. I was feeling pretty rough and in desperate need of a coffee to liven me up; having only just met Rosie and Herry for this trip I didn’t want to subject them to my hangriness. One iced Vietnamese coffee later (which by the way is DELICIOUS) we were mooching around the Reunification Palace, which was actually designed around the symbol which means “good fortune”. 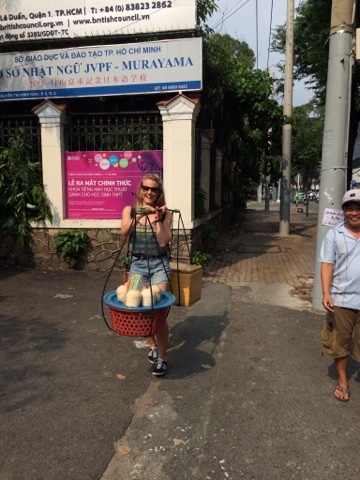 En route to the War Remnants Museum we helped a man with his coconut baskets and naturally got coerced into buying some coconut milk which was surprisingly nice! The museum itself was eye opening and truly harrowing. I remember learning about the war in year 10 history with Mr Craig (I think that was his name?!) but the true devastation of it really hits home when you see the photographic evidence showing the destruction of the country and so many innocent people. Not only those at the time, but in particular those whose families are still affected generations later from the awful toxins of things like agent orange. 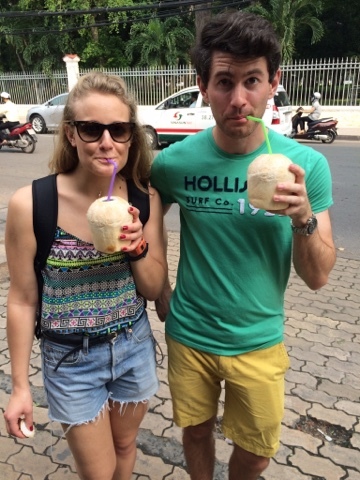 To liven up after this experience we headed over to Notre Dame, in Vietnam you say?! Yes, the French colonists in the 19th century built this cathedral; all of the makings were imported from France. The official name is Saigon Notre-Dame Cathedral Basilica. It’s situated right near the gorgeous and huge Post Office building which has become somewhat of a tourist attraction yet still functions as a post office for the public. There are souvenirs and cards to buy and send! The final stop was the Bitexco Financial Tower standing at 862 feet tall. 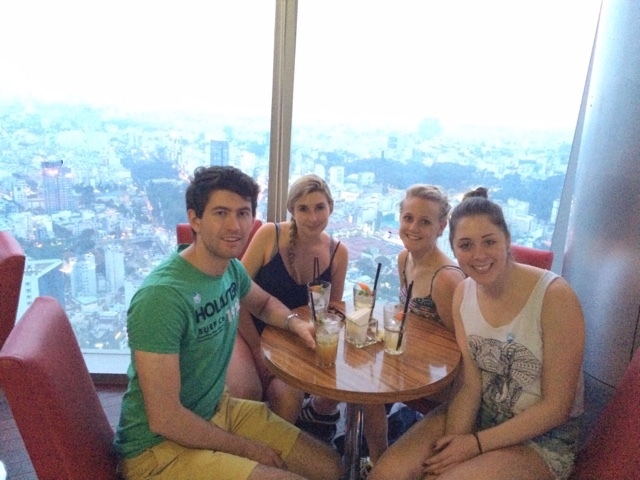 We indulged in an expensive cocktail and watched the city from above as the sun set in a somewhat cloudy sky and the lights started to come on – it was really cool! 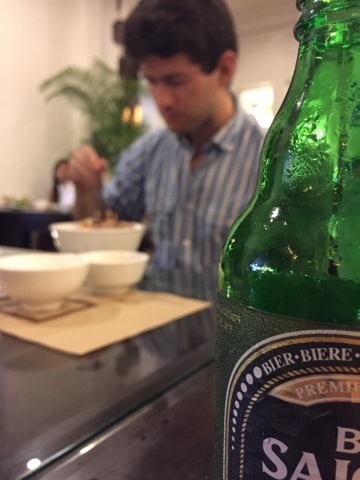 We ate our evening meal at a great place recommended by our helpful hostel staff; Nha Hang Nygon. The stir fry was delicious and we tested our chopstick skills. Then it was straight to bed as we’d walked 23,000 steps and couldn’t remember the last time we’d slept; zzzzz. 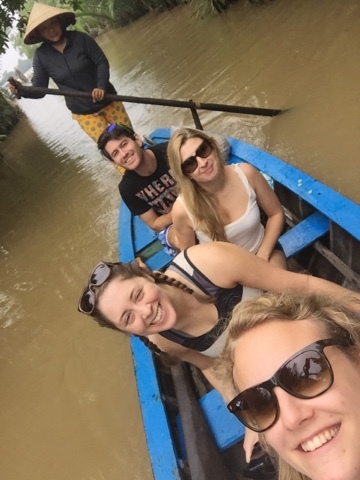 Rise and shine for a trip West to what lonely planet describes as the “rice bowl” of Vietnam – the Mekong Delta. On a small tour of 10 we travelled for around 90 minutes. 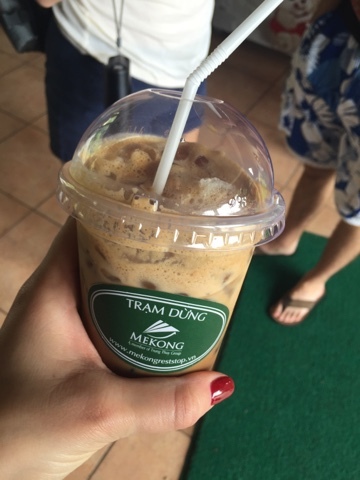 At the rest stop Rosie and I indulged in another delicious Vietnamese ice coffee mmm, then we headed to My Pho. 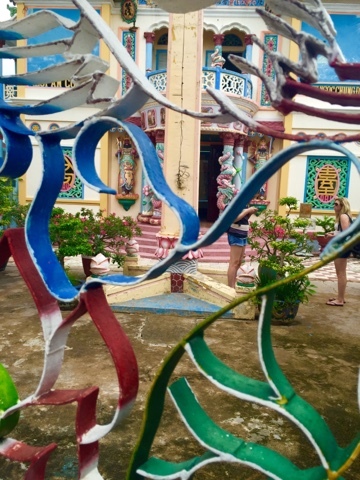 The first stop was the Cao Dai (high palace) temple, a local religious spot which incorporates aspects of Buddhism, Taoism and Confucianism – each represented by aspects of the building. 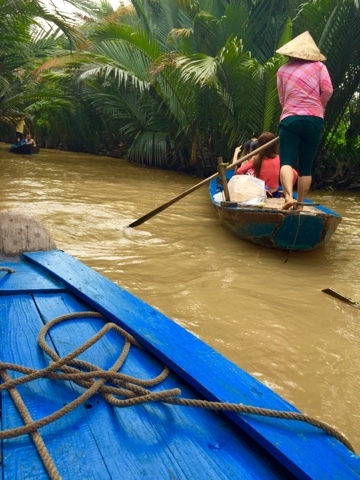 Next we took a boat down the Mekong Delta river (which is 4,800km long and actually starts in China) towards the province of Vĩnh Long which was only recently connected to the mainland, the city of Cần Thơ, via a bridge in 2010. It was here we were taken down the river in smaller rowing boats, by Vietnamese ladies wearing nôn lá, leaf hats; very relaxing and scenic, in particular many many coconut plants. A lot of the Mekong Delta is connected by canals and rivers and these living there get around by boat. 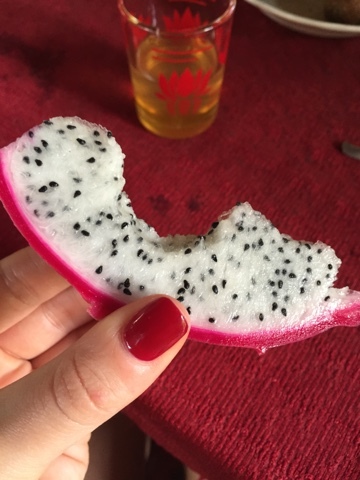 We tried some exotic fruit, sampled the delights of honey tea and were then taken via motorbike cart type thing to a riverside restaurant for a fabulous meal of deep fried “elephant ear fish”, rice paper, noodles, rice, spring rolls, soup and veg. Another boat trip took us to a small place which made coconut candy, we were shown how it’s made and tried some bits – much more natural than a bounty I tell you! 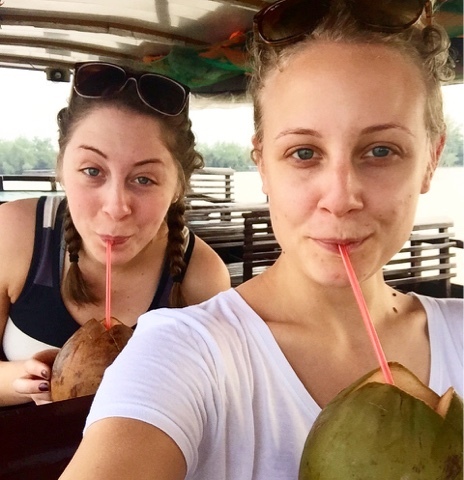 We drank coconut milk on the way back to the shore before our final stop at Vinh Trang Pogoda. One of the most famous landmarks in the area, it has three huge impressive Buddha statues and some intricate details to the building. 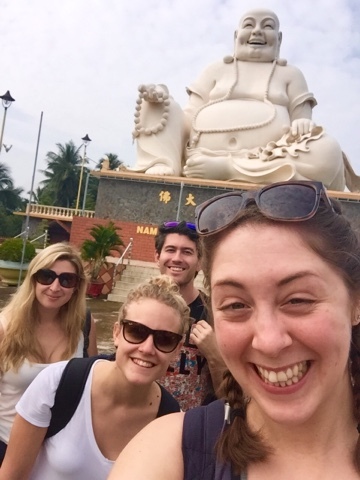 A few selfies with the Buddhas and we snoozed en route back to the hostel. Juuuuust as we were about to head out for some food, the heavens opened and a monsoon fell on us! 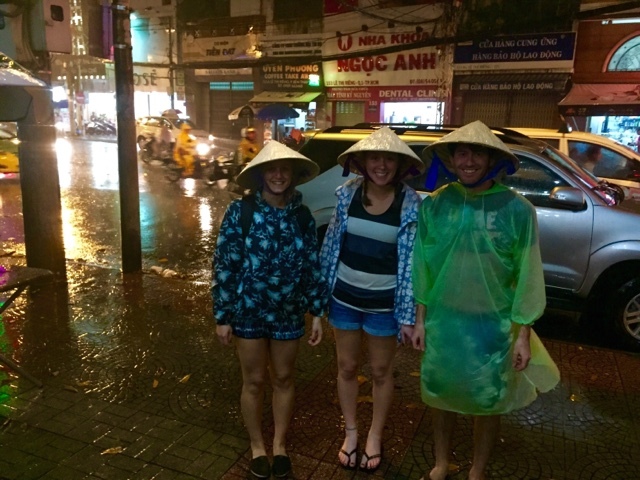 We got kitted out in raincoats and leaf hats and splashed around the city looking for dinner. 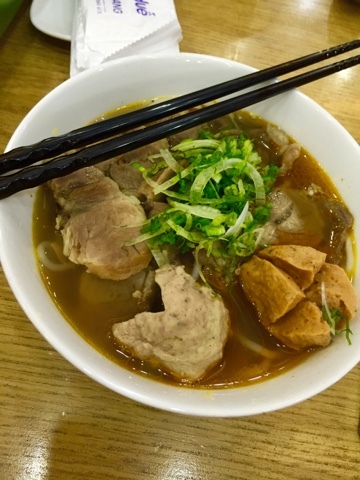 Having found a very Vietnamese spot, we managed to negotiate beef and meatball noodle soup – very tasty and cheap too.